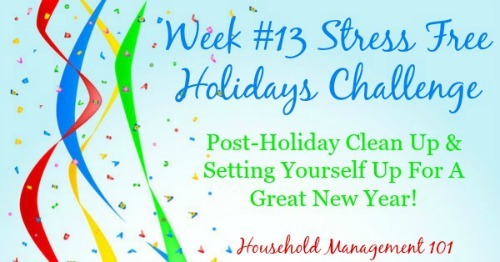 Now that the holidays are over (mainly) you would think holiday stress would be a thing of the past, but instead, you can get stressed thinking about the clean up. Find out below how to ease back into your normal routine without causing more stress in your life. Can you believe that the Stress Free Holidays series is now at an end? We started this series 13 weeks ago, at the beginning of October, and planned and baby stepped our way to a stress free and enjoyable holiday season, celebrating the "big 3" holidays of Halloween, Thanksgiving and Christmas. Now that Christmas is over we have one small celebration left -- getting ready for New Year's, and the task of cleaning up from Christmas and easing back into our normal routine. I'll talk about both in turn as this series comes to a close. If you are planning anything special for New Year's Eve or New Year's Day you will need to go ahead and get any supplies now, and make any other plans necessary for the celebration. For example, in my husband's family they always eat cabbage on New Year's Day. I'm actually not really sure why, but it is a tradition, so we always make sure we buy some at the grocery store. Similarly, go ahead and make your menu and grocery list now, and get all these supplies well in advance so you don't have to run out at the last minute which can contribute to post holiday stress. Now that Christmas is over it's time to tell everyone you love who gave you a gift thank you. If you printed out your gift tracker template back in Week #10 of the Challenge this won't be too difficult. You've already got a list of everyone who gave you presents, and a bit of information about the gifts to jog your memory and help you write more personalized thank you notes. I would encourage you to not only write notes yourself, but to get your kids involved in the process as well for their own gifts. It's never too early to help them learn a sense of gratitude and to express it to those who love them in return. It takes a big effort to get all those Christmas decorations out and put up, but there is an excitement in the air when you do it which makes it fun. After Christmas is over it takes just about as much effort to put everything back away, but it seems like the excitement is gone, making the task seem more like a chore. Try to do just a bit each day so it doesn't seem so overwhelming, and set a deadline for yourself to get it all done so that you still don't have those Christmas decorations out on Valentine's Day. Make sure to get rid of any decorations you know you won't use again, and pack away everything in an organized fashion to make it easier for yourself next year to get it back out. Taking the time now will reduce your holiday stress next year, and you'll thank yourself later. 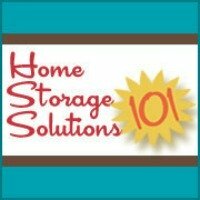 You can read this article on Christmas decoration storage, on another of my sites, called Home Storage Solutions 101 for more ideas and instructions. There is also time to buy Christmas decoration storage containers, if they are needed, along with Christmas decorations and wrapping paper for next year, since these items are typically at a deep discount right after Christmas. Make sure you store all newly purchased items with your Christmas decorations so you can easily find them next year when you need them. 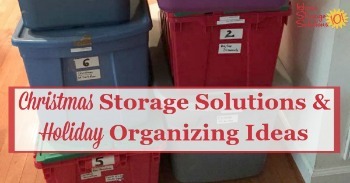 I've got lots of suggestions for Christmas storage and holiday organizing here, a section of the site also on Home Storage Solutions 101! While slowly putting away your Christmas decorations ease yourself and your family back into your pre-holiday routine, so everyone and everything in your home can get back to normal and any post holiday stress you are feeling will quickly dissipate. Finally, with the end of the holidays and the end of the year fast approaching this has many of us thinking about our plans for next year. I believe it's a very good practice to sit down, with your spouse if you have one, and set your goals for your family for the upcoming year. Identify the areas in which your family is doing well, areas where you need improvement, and fun activities you can all do together this coming year. 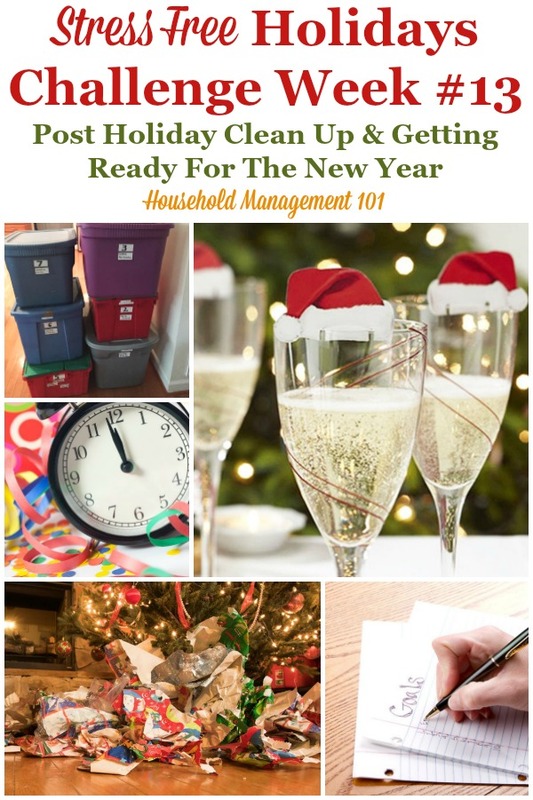 You can also begin to think about your resolutions for the coming year for both yourself and your family, since that is the focus of the next series here at Household Management 101. This coming year I'll be focusing on one habit or concept related to family and household management each month. I invite you to come along on this journey with me, if you're interested. 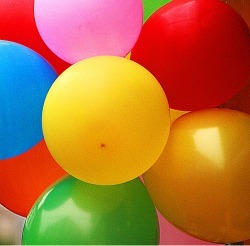 The plan is to work on one habit a month, until we have it ingrained, and then move on to another one. You can check out all the habits I have planned on my New Year's Resolutions page. I hope this series helped you have a great holiday season this year, and I wish you all a Happy New Year! Here is a recap of the previous parts of the series, now that it is complete. 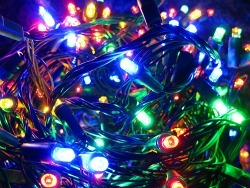 Hopefully it helped you experience holiday stress relief.